An important factor in baculovirus expression is assessing when to passage Sf9 cells, which are commonly used to make recombinant viruses or for protein production. In our last blog we talked about how to make the transition from monolayer to suspension cultures and how maintain cells in a healthy state during this time. To define what is meant by ‘healthy’ cells, Figure 1 shows a sample of healthy Sf9 cells which appear largely uniform in size and round. What doesn’t come across in a web-based image is how the cells have a ‘shiny’ appearance. Although hard to define, when you see it you will recognize it! Figure 1. Healthy Sf9 cells in monolayer culture at 3 days post establishment in a T25 flask. Regardless of the type of culture media you are using, cells harvested at maximum density to seed a new culture often experience a significant lag in growth before they resume normal division rates. The most likely reason for this is that when harvested, the cells were entering the stationary phase and so take a little more time to recover. This can be an issue if you wish to use the cells in immediate experiments. There is also the ill-defined role of any growth factors produced by the cells that aid their multiplication. This is a vague topic that hasn’t ever been addressed with any rigour. However, what we do observe, particularly in suspension cultures, is that Sf9 cells diluted to less than our recommended number/ml can struggle to grow. This doesn’t seem to apply if you grow cells in the presence of serum. We routinely propagate Sf21 cells (the parental line for Sf9) in such medium and they can be diluted to less than 105cells/ml with perfect recovery. Taking all of this into account the questions still remains – how thick you should allow your cells to become before sub culture by dilution? 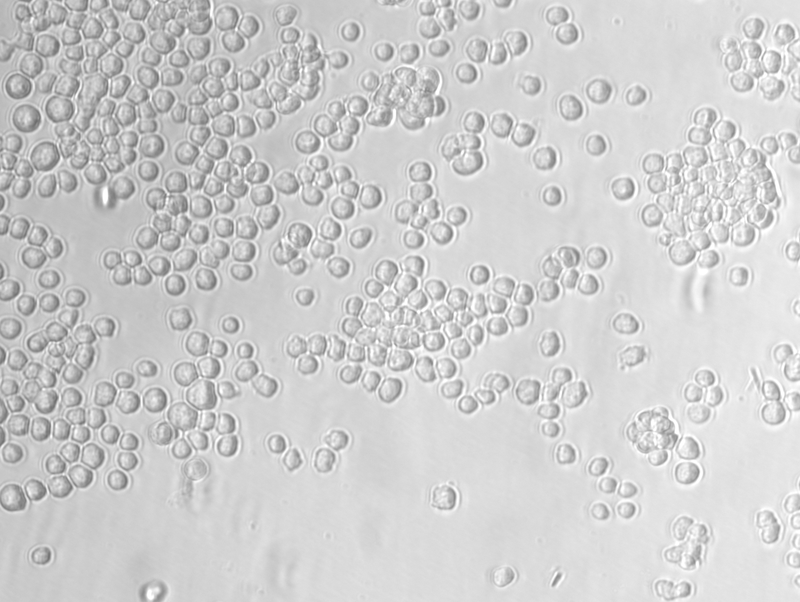 Sf9 cells can be seeded into a new suspension culture at a concentration of between 0.5 – 0.7 x 106 cells/ml for routine maintenance of cell stocks. These will then roughly double every day until they reach a concentration of 107 cells/ml (sometimes higher). You might think that this is the best point to passage Sf9 cells. Unfortunately, when cells reach this density they are probably close to exhausting the available nutrients in the medium. Like an aircraft struggling to reach maximum altitude in thin air, the culture may suddenly stall and viability crash! This is not a criticism of the cells or medium, just a fact of life when working with a biological system. Ideally passaging cells in suspension should occur when they are between about 3 – 6 x 106 cells/ml. In this window, the cells should be in a really active growth phase and happy to be diluted a little. They will continue their amplification without noticeable pause. Our rule is that it is better to keep cells in a healthy condition rather than worry about passage number.